OSHA is expected to update its Hazard Communication standard to include the new Globally Harmonized System of Classification and Labeling of Chemicals. The Free whitepaper is available from the Brady website here. 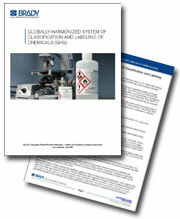 This entry was posted in General and tagged download, FREE, GHS, Globally Harmonized System, Whitepaper. Bookmark the permalink.